Saigon Pearl apartment for rent, in block Ruby tower 1, High Floor 31st floor nice view to district 1 and Saigon river, Open kitchen, price 1200 USD/month. Saigon pearl apartment for rent – located along Saigon riverside – is a 5 – star tower, will suits every single of your desire. In addition, the Saigon Pearl apartment is perfectly designed with modern furnishment, great decor, very nice rooms and sparkling light system will surely satisfy even the most difficult person. Morover, the Saigon Pearl apartments has a chain of restaurants, bars, coffee shops and supermarket, that help you shorten your time, bring the convenience to you. 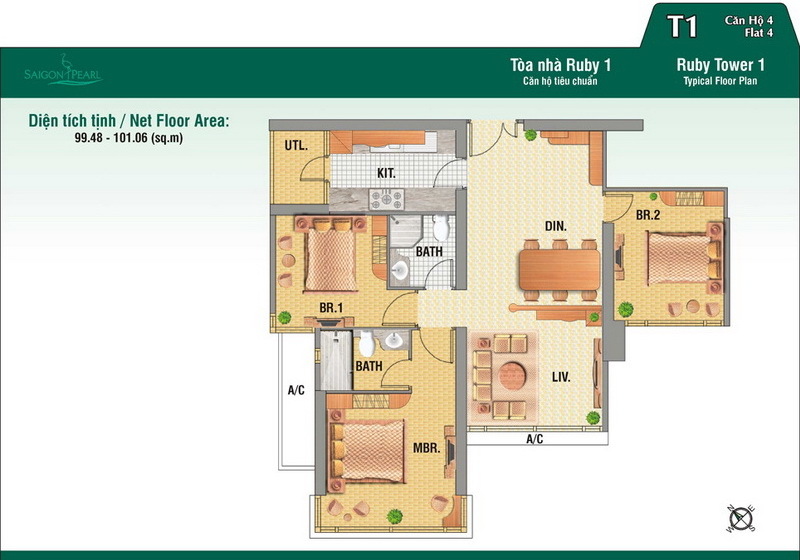 Apartment for rent in Saigon Pearl have area of 85 square meters. This Saigon Pearl apartment for rent in Ruby tower 2 nice view to Ho Chi Minh city and Saigon river, fully furnished with washing machine, air conditioner, shower tub,..
Saigon Pearl apartment for rent in Topaz Tower 1 has area of 90 sqm, inside include: 1 living room, 2 bedrooms, 2 bathrooms and dining room, fully furnished. Price for rent is 1000 usd/month. It is on 8th floor view to.. Apartment for rent in Saigon Pearl, 3 beedrooms in 122 sqm, high floor, in Ruby tower 2, in Binh Thanh District, Ho Chi Minh City, Viet Nam, Saigon river view, curtain and other appliances, such as dinning table, 42 inches tivi,..
Saigon Pearl apartment for rent in Ruby tower 1 with price 1800 USD / month, area of 206 sqm, 20th floor, include: 4 bedrooms - 3 bathrooms - 1 livingroom - kitchen and beautiful balcony, unfurnished. This apartment view to Saigon..